We are able to offer our customers several levels of balancing from a fairly basic rebuilders balance, High performance street, or all out racing. The factory balance of crankshafts can vary a great deal depending on the application and the OEM tolerances. For a low rpm stock engine, plus or minus 8 to 10 qrams or more may be close enough for the average Joe. For a street performance engine, those numbers should come down to plus or minus 3 grams or less. And for a high revving NASCAR engine that spends most of its time at 8,500 to 9,500 rpm, plus or minus 1 gram or less is the rule. How much is 1 gram? Not very much. A dollar bill weighs one gram. A penny, by comparison, weighs about 2-1/2 grams. An ordinary sheet of office paper tips the scale at a whopping 5 grams, which is more than the amount of imbalance that's generally desired in a street engine. "Performance" This spec is for basically stock engines, or for those who want a balance job that will keep their engine from "self consumption". 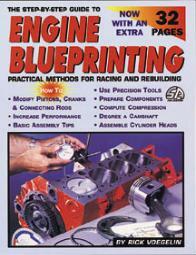 This is recommended for every engine, even bone stock! The dynamic tolerances are set to .7 oz. in. (19.8 grams). Connecting rods are balanced overall to within 1 gram and pistons are balanced to within 1.5 gram. Budget $275.00 for this service. "Intermediate" This is the most used tolerance; it allows for a well balanced engine, is affordable and provides balance good enough for a sustained 6,000 RPM engine. Dynamic Balance tolerances are set to .5 oz. in. (14.2 grams) and Connecting rods are weighed end to end to within .05 gram, and pistons to within .75 gram This is the most typical state of balance. Budget $350.00 for this balance job. "RACE" Our RACE an extreme level of balance and is good for 6500-9000 RPM engines. This is the highest state of balance we offer and we maximize the equipment with tolerances of .2 oz. in.. In this balance we take everything to the extreme, Connecting rods are balanced to .1 gram end for end, and pistons to within .1 gram. 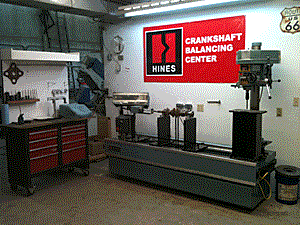 This balance takes a lot more time than any other tolerance and is not a flat rate service. Plan on spending $450.00 for this balance service. With an internally balanced engine, you need to bring" crankshaft all rods all pistons with pins one set of piston pin locks (if used) one set of rod bearings If desired the balancer and flywheel can be balanced at the same time for an additional $75.00. OE GM acceptable tolerance was 2.0 oz. in. (56.7 grams). dynamic weight of over 700 pounds when it’s placed on a rapidly turning crankshaft counterweight. This is why balancing is a vital part of engine blueprinting. that are doing a little of both. This helter-skelter motion produces some very strange vibrations. the cylinder banks, however, and the reciprocating assembly can be balanced much more easily. configuration of cylinders, can be silky smooth. when it is time to balance an engine. piston locks, rings, the reciprocating and rotating parts of the rod, and the rod bearings. the bobweight must be computed. engine—and how much it affects rotating and reciprocating weight—are difficult questions. bobweight calculation to represent the oil film on the moving parts. theoretical advantages to overbalancing, the benefits are difficult to discern. should be in every enthusiast's tool box.